The best way to start one’s day is by reading something positive and inspirational. 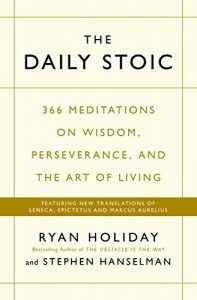 For 2018, I used The Daily Stoic: 366 Meditations of Wisdom, Perseverance, and the Art of Living by Ryan Holiday. I discovered the book through one of my trusted review sources, the blog of Brad Feld. He wrote about it towards the end of 2017. After reading his review, I figured it would be a great way to start my day throughout 2018. Previously, I had been using numerous blogs for daily readings, but there’s something different about a daily reading that follows a theme and has a purpose. For me, it’s one of the many things that makes The Daily Stoic special. This entry was posted in Book Reviews, Must Reads and tagged Books, Must Reads on January 7, 2019 by Gregg Borodaty. You would think that a self-help book written over 100 years ago, in 1903 to be exact, would not be applicable in the modern world. A person writing a book at that time would not have to deal with the distractions of mobile phones, email, social media, and incessant negativity in the media. How could their wisdom possibly help someone today? As it turns out, some pieces of wisdom are timeless when it comes to personal development. 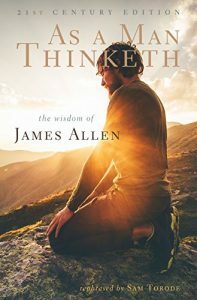 The guidance James Allen provides in As a Man Thinketh is one such case in point. It was the first book I read in 2018, and it was a great way to kick off the year. This entry was posted in Book Reviews, Must Reads and tagged Books, Must Reads on January 5, 2019 by Gregg Borodaty. During 2018, I read 27 books, which is slightly above my average for a year. I read a mix of science fiction, personal development, business, and general fiction books. As I like to do every year, here’s my best of list from the past year. You can use these to round out your 2019 reading list if you’re in need of a few suggestions. This entry was posted in Life Journal and tagged Books on January 4, 2019 by Gregg Borodaty. My adventure has been both interesting and rewarding. What’s interesting is that once you make the choice to explore a specific genre of books, you discover that the depth of books in that genre is limitless. In addition to getting tips from Amazon’s relentless recommendation engine, the books themselves contain their own recommendations, reading lists, and resources to explore. Such is how I discovered The Happiness Advantage by Shawn Anchor. The book was suggested reading in The Slight Edge by Jeff Olson, which was one of my top reads for 2017. 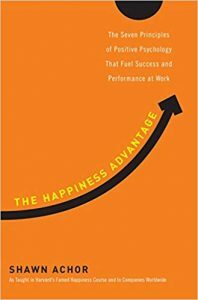 So it should come as no surprise that The Happiness Advantage was one of my top suggested reads for 2018. So yes, even though I finished the book over a year ago, here is my review. This entry was posted in Book Reviews, Must Reads and tagged Books, Must Reads on January 2, 2019 by Gregg Borodaty. As I do each year, I finished organizing my reading list for 2019 this past week. While my list is still ridiculously long at over 200 books, I did a better job of managing it during the past year. I read 27 books and only added 36 the list. Given I read 25-30 books per year, I’m still sitting around 8 years of backlog. This entry was posted in Life Journal and tagged Books on January 2, 2019 by Gregg Borodaty. I have a well documented love-hate relationship with the Amazon recommendation engine. Sometimes it’s spot on, and other times not so much. No matter the case, it’s omnipresent and seems to follow me around. 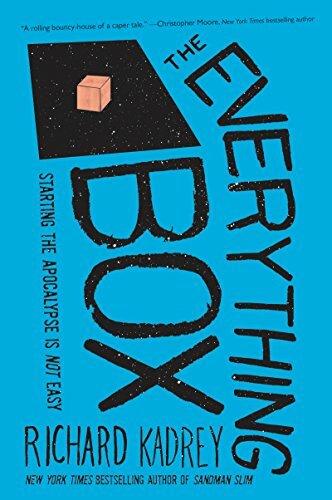 My latest read, The Everything Box by Richard Kadrey, came courtesy of the Amazon recommendation engine through their sci-fiction and fantasy newsletter. I subscribe because I like seeing what’s up and coming in the science fiction genre. 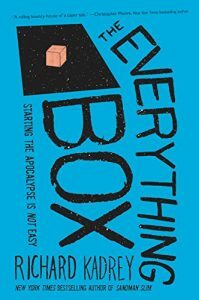 The Everything Box, as it so happens, fits more into the Fantasy domain. I figured I’d still give it a shot to see if the recommendation still had “it”. This entry was posted in Book Reviews and tagged Books on December 18, 2018 by Gregg Borodaty. Given how out of control my reading list is (200 books and climbing), it can be a while before I get to one I’ve added. 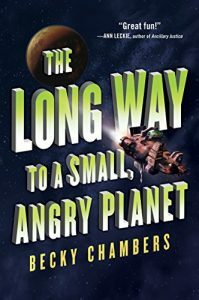 Such was the case with The Long Way to a Small, Angry Planet by Becky Chambers. The book made the Gizmodo Best of 2015 list, that was published in December of 2015. I added it then, so it took a couple of years to get around to reading it. Given the length of time some books languish on my reading list, that wasn’t all that bad. In fact, there’s books that have been on my reading list for over 5 years. I’m beginning to wonder if I’ll ever make it around to cracking those open. This entry was posted in Book Reviews, Fun Reads and tagged Books, fun reads on December 15, 2018 by Gregg Borodaty. Over the last few years, I’ve discovered that success is directly correlated to how we manage ourselves, especially our inner voice or self talk. To improve, I’ve sought out a number of books on the topic and have adjusted my routine by adding a morning reading session focused on personal development. One of the books I consistently come back to is Psycho-Cybernetics by Dr. Maxwell Maltz. It has had such a significant impact that I figured I should pick up another book authored by him (or in this case inspired by him), which led me to Zero Resistance Selling. A couple of things stand-out with regards to the book. First, it would appear that it is a book about sales, which it is. However, there is a lot of things you can take from the book and apply to your specific career and, more generally speaking, your life. 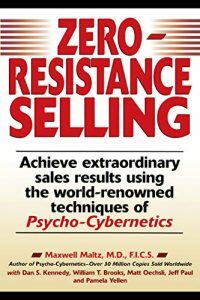 Second, the book isn’t directly authored by Dr. Maltz but by a collection of five authors who apply his Psycho-Cybernetics teaching to the profession of sales. Regardless, the book still feels as though it is written in the voice of Dr. Maltz himself. This entry was posted in Book Reviews, Must Reads and tagged Books, Must Reads on November 18, 2018 by Gregg Borodaty. A couple of the computer science topics that I am deeply interested in are machine learning and artificial intelligence. I’m particularly interested in the progress and development of artificial intelligence. It’s already a part of our everyday life. Currently, it’s narrow in the tasks that it handles. If you’ve ever used Google’s search engine, the Facebook news feed, a maps application for directions, or the sales chat/IM features on a website, you’ve interacted with AI. The development path for AI is to move it from narrow to more general tasks. 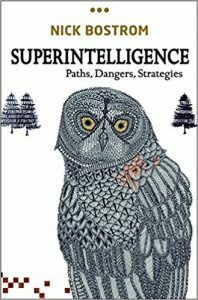 It is here where there is a fear that AI will reach the point of “singularity.” Singularity is considered the point of runaway technological advancement where the AI moves from narrow tasks to general intelligence. At that point, it develops the ability to learn, or improve itself, faster than humans can control it. In the apocalyptic scenarios, the AI evolves rapidly to the point where it sees humans as resources to be optimized, which might eventually result in the extinction of the human race. While that is the grim side, there is also the hopeful side that a runaway AI will usher in a new age of prosperity for the human race in which rote, menial tasks are done by machines while humans can focus on more meaningful items. This entry was posted in Book Reviews and tagged Books on September 9, 2018 by Gregg Borodaty. To keep myself honest with my diet and fitness, I like reading the occasional health related book. Through various referral paths, I got turned on to The Endurance Handbook by Dr. Philip Maffetone. 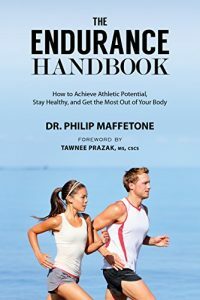 Dr. Maffetone has spent most of his career working with endurance athletes to help them achieve peak performance and has written many books on the subject. In this book, Maffetone describes the methods and routines he teaches endurance athletes, which he has wrapped into a program that he calls the MAF Method. What stands out about the MAF Method is that it’s not your conventional training program. It eschews a lot of the “no pain, no gain” themes that are the foundation of most modern workout programs. Instead Maffetone’s focus is on teaching the body to use and burn fat for energy rather than carbohydrates. While this is an important concept for endurance athletes, there’s a lot you can get out of the book even if you are just looking to futher your knowledge of nutrition, training, and fitness. This entry was posted in Book Reviews and tagged Books on August 20, 2018 by Gregg Borodaty.